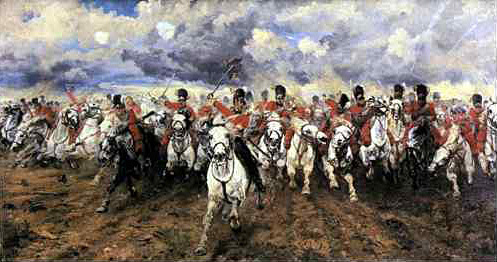 Painted by Elizabeth Butler, Scotland Forever (1881), depicts the charge of the Heavy Cavalry at the battle of Waterloo fought in 1815. The British victory at Waterloo ended the Napoleonic Wars, and ensured Britain’s position as the worlds most dominant imperial power. Elizabeth Thompson, later Lady Butler, was a leading artist of military scenes in the late nineteenth century, and she continued to exhibit at the Royal Academy until 1920. Her pictures depicting soldiers in battle led John Ruskin to admit that he’d been wrong in asserting that women could not paint military scenes. Married to Lieut. Gen. Sir William Butler, Elizabeth Butler took care to draw soldiers as accurately as possible. Although she never observed soldiers fighting in battle, she did watch soldiers training on maneuvers and took great care to correctly represent military uniforms. The enormous popularity of military paintings in the late 19th century, especially those depicting the Napoleonic period, suggests that there was a nostalgic desire to return to a past imagined as glorious and unchallenged. Source: Butler, Elizabeth. Scotland Forever. 1881.